The final full day in Chiang Mai we drove up to Doi Suthep, a mountain that is immediately to the west of Chiang Mai and offers, on a clear day, a nice view of the greater Chiang Mai area. 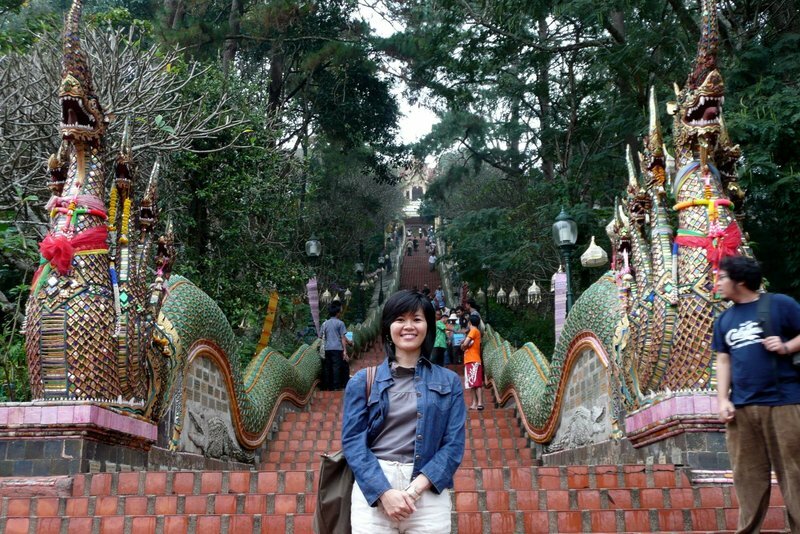 On the top of the mountain is a temple which ostensibly dates back to the late 14th century and is one of the most significant sites for Thais to visit. It is also a very beautiful temple so is well worth the trip up the winding 13 km road from the city. Stephanie and I picked up my friend Kari, who recently moved back to Thailand from Kenya with her husband Ron. They are both missionaries whom Tawn and I first met when I was attending Union Language School after first moving here four years ago. The day was drizzly but as we drove up the mountain, the drizzle subsided replaced by a thick fog. On the way up we had to stop and help a family whose pickup truck had slipped into a small ditch at the side of the road. Thankfully, only one tire was in the ditch and with the help of another driver, we were able to jimmy it free. The base area of the temple has lots of tourist shops, stalls, stands and vendors. It is a bit of a circus. Thankfully there were not too many people there thanks to both the inclement weather as well as the depressed tourism situation in Thailand. There are two ways to reach the temple: you can either take a short cable car ride or you can walk the 300 steps (decorated with beautiful nagas, or multi-headed serpents). Here’s a photo of Stephanie posing before we began our ascent. 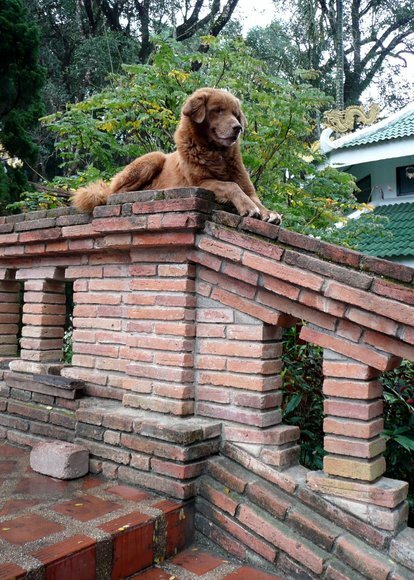 One of the vendor’s dogs sitting on the wall, imitating the nagas in the previous photo! The temple is perched right on top of the mountain and is surrounded by lush tropical forest. 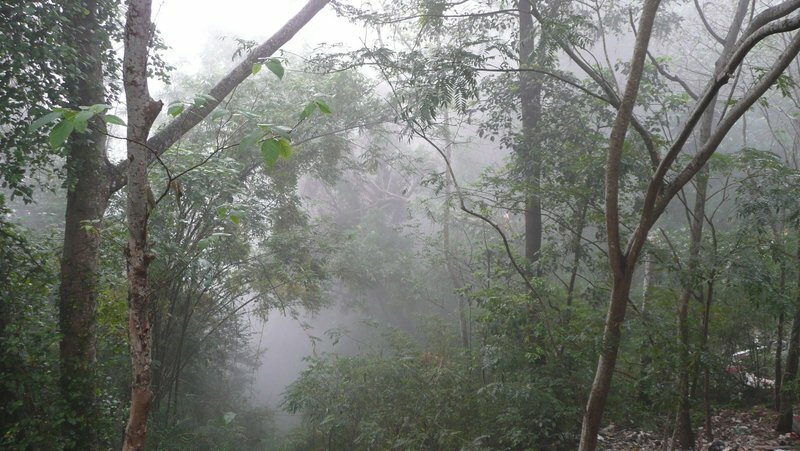 The fog was very thick and advanced quickly, swallowing up the mountainside. This picture reminded me of something from the movie “Crouching Tiger, Hidden Dragon”. Looking down to the area where the monks’ quarters are located. Visibility was down to about 30 meters. Note the lanterns. These are a very typical Lanna / Northern Thai style lantern. Beautiful, no? While taking pictures the fog started to turn into a mist and, eventually, drizzle. Thankfully we had our umbrellas with us. The main chedi, or stupa, is covered in gold with four gold umbrellas standing on the corners. On a sunny day it is beautiful and makes a striking contrast with the blue skies. See this photo as an example. Today, however, we just had to appreciate it at a different level. In fact, the fog/mist/drizzle lent an interesting serenity to the place. Rare to get a shot here with no visitors in it! I like the drops of water on the statues. After about an hour poking around we decided the dampness was getting to us and descended to the parking lot area. From the main entrance we looked back up towards the temple and the summit, which was now entirely shrouded in the clouds. While in Chiang Mai we had the opportunity to eat quite a bit of Northern Thai food, which offers some of the best dishes in all of Thailand. Here is a spread we had one night. 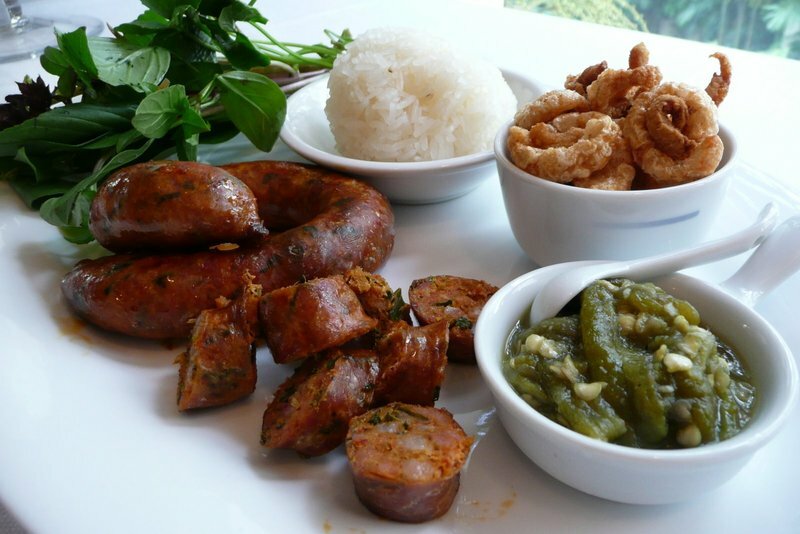 In the upper left is a variety of vegetables and a Northern style sausage called sai oua. It is served with a green chili dipping sauce (available in varying degrees of spiciness) called nam prik ong. In the center is a red pork and chili dipping sauce called nam prik num. It is more savory than spicy. You eat it with the fried pork rinds in the upper right. That’s right, Thais love cracklins! The bamboo container in the lower left features khao niaw or sticky rice. 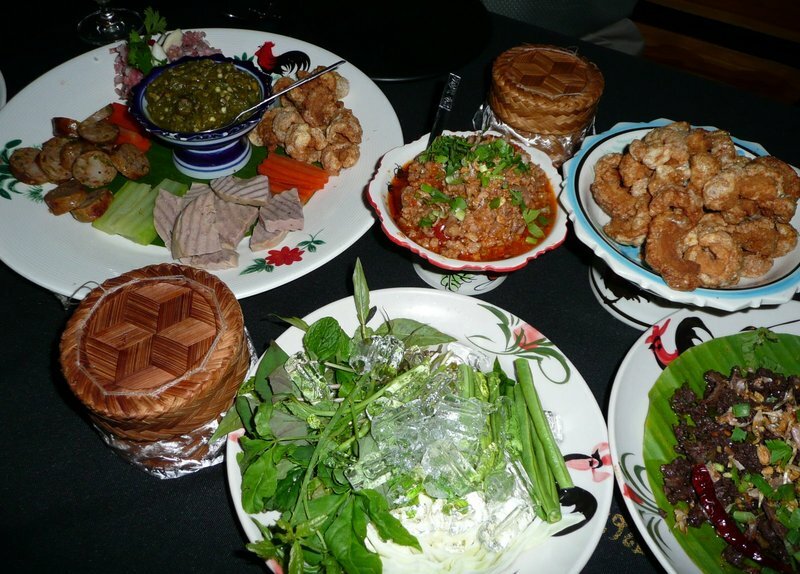 In the center is a plate of raw veggies and herbs served on ice, which are eaten to cool the spiciness. Finally, the dish in the lower right is a salad made of sun dried pork, shallots, peanuts, cilantro and chilies. Here’s another view of the sai oua and nap prik ong and khao niaw. I bought some at the Chiang Mai Airport at a vendor who has been around for years and carried it onto the plane. That’s right – you can bring super-spicy green chili sauce onto the plane here as a carry on. Bottled water through security? No. But nam prik ong? Absolutely fine. Everyone knows that isn’t dangerous. 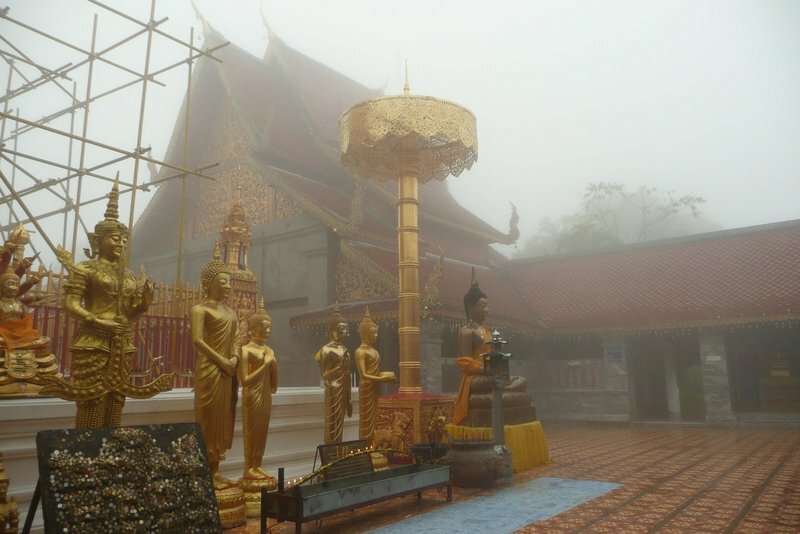 This entry was posted in Uncategorized and tagged Chiang Mai, Doi Suthep, food, Thailand, travel by christao408. Bookmark the permalink. Your video is so good! I kinda was expecting to see the accent and diction we talked about… maybe next time? The dog snap and the close up of statues are my favorites in this lot. Loved this post! I am making sure this is on my agenda of my world tour… As for the food it looks delicious if dangerous! I lost a tooth (at the age of 5) eating cracklins! Who would have thought that would be a common point between to such divergent cultures. hehe. And if I couldn’t have the water there would be no way I’d want the nam prik ong! I was wondering where the food pics were! :DYum! 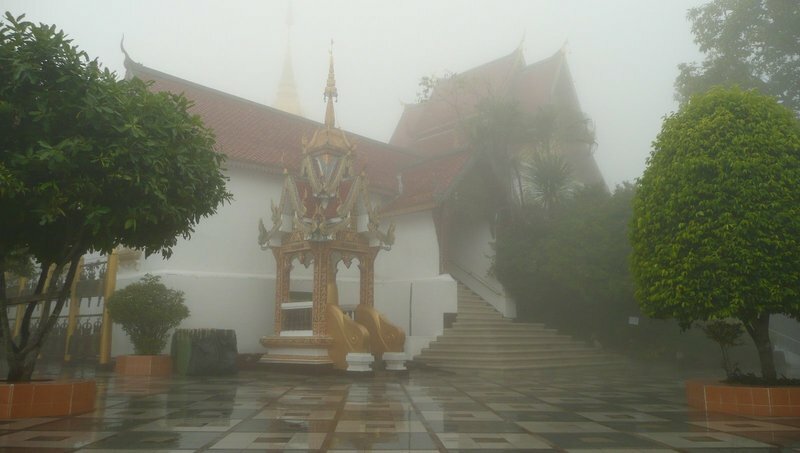 I love the pictures of the temples in the mist, rain and fog. In your video, the last scene could be in a movie. It’s too bad you don’t have a picture of the dog and the naga together. That would have been very interesting. Chiang Mai is such a gorgeous city! I remember wishing I could spendd more time there. I didn’t get to see any of the touristy/fun stuff at all, though, which was kind of disappointing. @Dezinerdreams – Thanks – as I was recording the narration I thought, Vivek is going to expect me to take more time with this. Maybe one of these days I’ll have a bit extra time to get it right. @Redlegsix – Chiang Mai is calling you…@murisopsis – Cracklins = national guilty pleasure in so many countries! @yang1815 – I didn’t put as much emphasis on the food this trip. Really need to do another trip just focused on the food. Need to buy my new Lumix LX-3 so I can take really good pictures of the food. @ElusiveWords – I thought about the dog and naga picture but would have had to climb out into the forest where there was a steep drop-off, or else moved the dog. He didn’t seem to keen to move. Glad you liked the video. It would have been nice to take more time to shoot additional footage as it was really beautiful up there that day. @CurryPuffy – You know, I have about 100 videos and I’ve considered combining them. First problem is that some are on PC and some on Mac. Other problem is I’m not sure exactly how to do it. @secade – While I kind of don’t like Chiang Mai because it has such a high foreigner to Thai ratio, there are many worthwhile things to see and eat there and nearby. @yang1815 – Yeah. There are a lot of retirees up there from all over the world plus a very large crowd of working expats and an even larger crowd of tourists. Chiang Mai itself is about a tenth the size of Bangkok (more or less) and so you really notice the foreigners. @christao408 – Wow, never knew that. 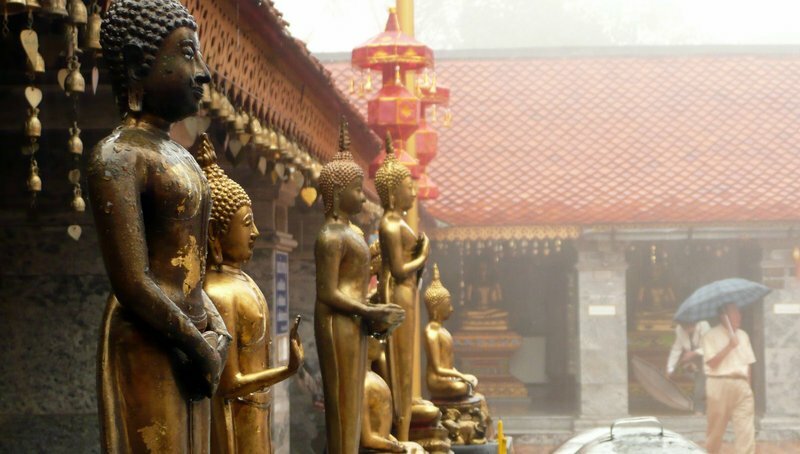 I have been to Thailand three times but never been to Chiang Mai! Jacquie and I are here remarking about how your life seems so incredible and exciting compared to ours; you go to all these wonderful places, and we basically sit around watching it. We’re talking about how we should follow your example.Again, a wonderful adventure. For now, unfortunately, we have to live vicariously through you.I have a question though, that I’m not sure you can answer completely here (but I’ll ask anyway): In the foreign countries I’ve been to, I’ve noticed that by region, there are marked differences in the cuisine of each region. In the US, we think “Thai food”; and it’s all one kind of thing — much like how in the US we view Chinese food to be all one kind of thing, when in reality, there are dozens of different kinds of Chinese cuisine. I wasn’t aware that Northern Thai was different from other regions. Maybe this would warrant a separate post altogether… but what are the differences in the cuisines of the various regions of Thailand? @arenadi – Mike, you live on a relatively small island in the middle of the Pacific Ocean. There are inherently some limitations on the number of different places you’re going to go! Not that Hawai’i isn’t full of wonderful places but you can travel for hours and still not be in another country. For me, a two-hour flight brings me to a half-dozen different countries.As for food, yes there is a lot of variation between the regions’ foods in Thailand. South, Central, North and Northeast are all unique although with movement of people there is a lot more mixing. I’d like to write more about this but don’t really know enough yet to speak with much authority. I’ll keep it in the back of my mind for future entries. 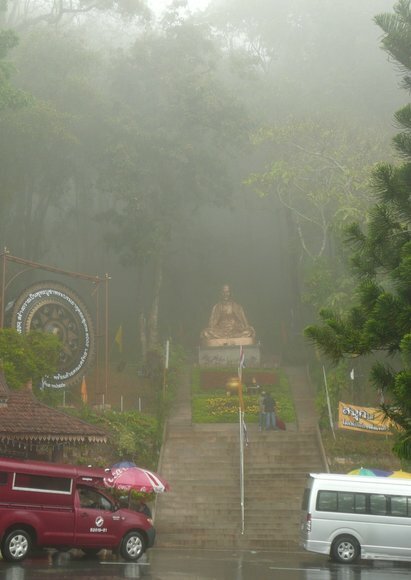 This was an amazing video and I was totally mesmerized by the beauty of the fog, the Stupa and the waterfalls. Just sitting around and looking at the fog is so uplifting. ( Do not drive in that kind of fog though, like I did yesterday. )As always, the visit with you was so pleasant and rewarding. Thank you. @christao408 – Do you mean like permanent foreign residents there, or just tourists? @secade – There are a lot of retirees up there from all over the world plus a very large crowd of working expats and an even larger crowd of tourists. 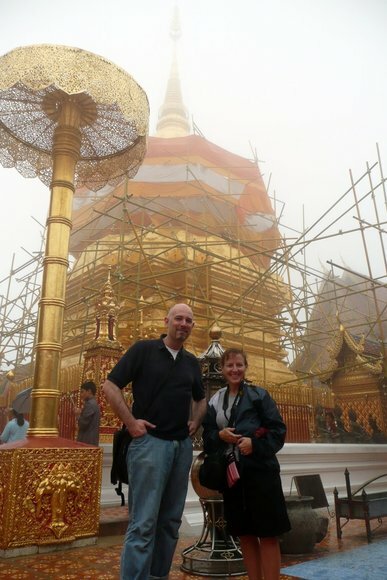 Chiang Mai itself is about a tenth the size of Bangkok (more or less) and so you really notice the foreigners@brooklyn2028 – Sheldon! How have you been, stranger? Yes, the dog was very cute and he looked quite statuesque. @ZSA_MD – I read about your drive through the fog. What a nightmare for you! @christao408 – I didn’t realize BK was that much bigger! 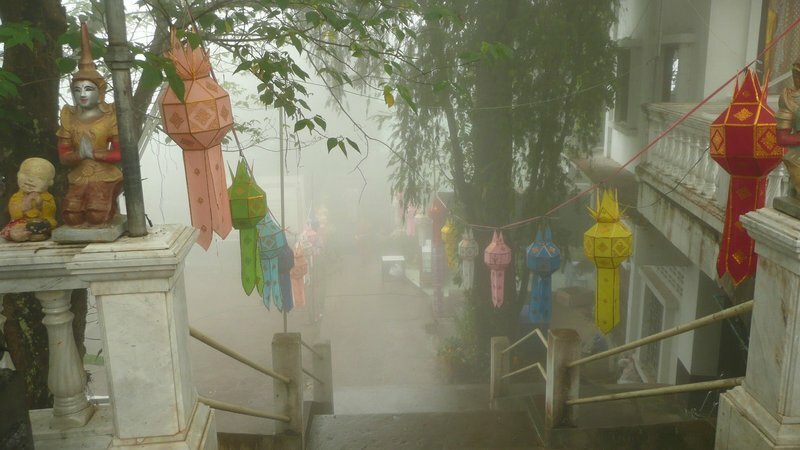 i only spent one night there, and it was just a layover before my flight to Chiang Mai. With that many foreigners, then yeah, I imagine you would really notice them pretty quickly. @brooklyn2028 – No worries, Sheldon. You’re a busy and productive man and that’s what we all admire about you! =D@secade – While exact population numbers are hard to get hold of, there’s about 8 million in Bangkok proper with another 3 million in the greater area. 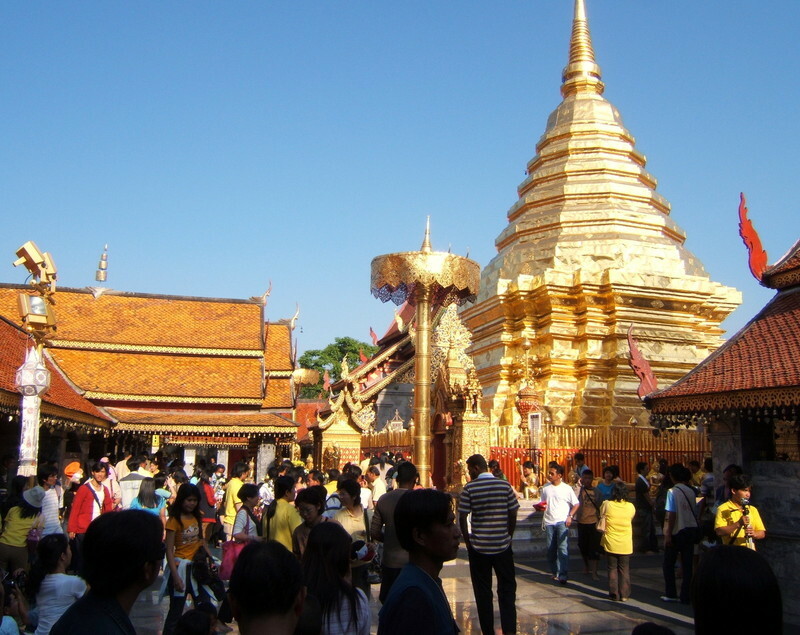 Chiang Mai has about 150,000 in the city and shy of 1 million in the greater area, so about a 10:1 ratio. Take that down another notch to my favorite northern Thai city of Chiang Rai and you have a city population of 60,000 with just over 1 million in the entire province! @Wangium – There were four people at the meal! looks like a feast to die for. worth the trip, i bet. American Hustle feels like a satire without the jokes. In any case, Skye, through her computer hacking skills and her capacity to bluff, manages to locate Coulson at a Centipede safe house in the middle of an old, Cold War era nuclear bomb range. Each member of this solid ensemble gets free reign to dive into their characters and take risks.